A picture of canine devotion, a Cocker Spaniel stands loyally by the coffin of his owner, one of the 290 people killed in Italy’s earthquake. The dog, called Flash, refused to leave the spot, repeatedly pawing at the casket that held the body of his master. It was yet another touching image to emerge from a natural disaster that has left so much heartache and grief. Flash’s owner was Andrea Cossu, 45, who was on holiday in the village of Pescara del Tronto when he was killed by a collapsing building. “The two of them were inseparable,” relatives told the Italian media. The picture was a striking reminder of the bonds between man’s best friend and their owners – a connection epitomised by the story of Greyfriars Bobby, the Victorian dog that held a 14-year vigil at the grave of his master in Edinburgh. The Skye terrier could not bear to leave his master's body and remained by his grave from 1858 to 1872. His owner was said to be John Gray, a local policeman. The dog is commemorated in Edinburgh with a life-size statue. Flash will now be looked after by Mr Cossu’s wife, who survived the quake. Dozens of survivors owe their lives to the police and fire service sniffer dogs who were deployed within hours of the quake striking on Wednesday. The dogs, among them Labradors and Alsatians, scoured the piles of rubble in search of signs of life underneath, closely watched by their handlers. 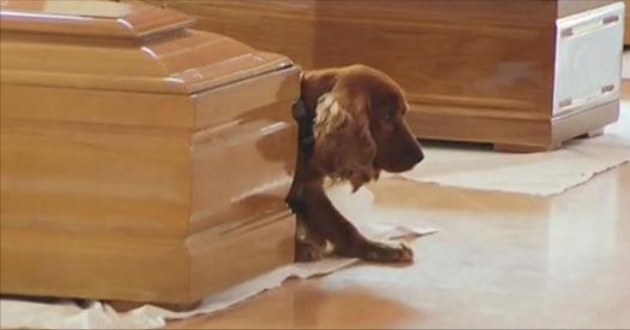 Responses to "Heartbreaking moment loyal dog refuses to leave owner's coffin after Italy earthquake"